A small card presenting the appearance of an official warning document, on further reading, reveals itself to be championing mutiny on the airwaves. A storm was brewing up in the early 1960s, fermenting strife and consternation among British politicians and regulators, as the swashbuckling pirate radio station Radio Caroline, based on board the MV Mi Amigo, broadcast pop music all day outside the territorial waters of the UK using unauthorised wavelengths. Owing to the lack of pop music aired on the mainstream broadcaster, the BBC, many off shore pirate radio stations were launched intending to make most of the opportunity provided by the growing number of listeners seeking a new and exciting sound. Broadcasting illegally their transmitters covered most of the UK securing a huge audience among the youth of the day. 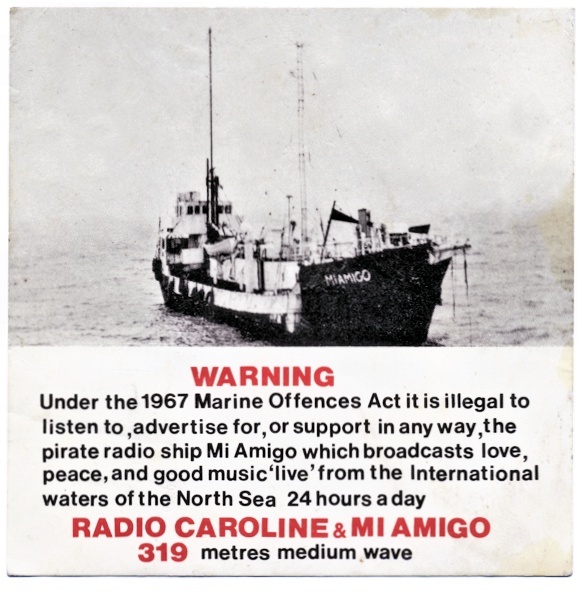 These enterprises were eventually overwhelmed by a tidal wave of legislation in the form of the 1967 Marine Offences Act making it illegal to advertise or supply an offshore radio station from the UK. Soon afterwards in September 1967 the BBC launched a new national radio station, Radio 1 for younger listeners, with many of the disc jockeys recruited from the ranks of pirate broadcasting.